If one is fortunate enough, as I am, to know MRS. MILLS (or 'GLAD' as she is affectionately known) they are privileged to have as a friend one of the most lovable people in the world. So much of show business is show - wearing a mask of comedy or tragedy and hiding one's real self, but MRS. MILLS is exactly the same in private life as the 'happy go lucky' image she presents so naturally to the vast audiences, be it television, radio, or in the theatre. 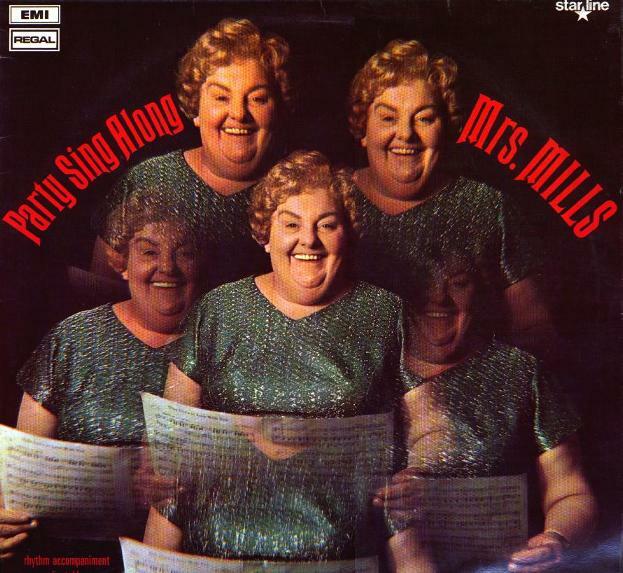 MRS. MILLS is a jolly, overweight hunk of humanity, a real person whose only aim in life is to make the world that she inhabits a happier place. Since then, she has never looked back, appearing numerous times on television, contributing to hundreds of radio programmes, and playing every major theatre in the United Kingdom. She has also appeared with tremendous success in Canada, South Africa, and Germany. Every LP she has made has been a best seller and her singles popular hits which are the party attractions in many homes. Her piano playing has the happy sound that is completely synonymous with her wonderful, cheerful personality. She is happily married to Bert Mills, and she and her husband live with GLAD's 'Little Mum' in Penn, Buckinghamshire. It is difficult to write cover notes for 'OUR GLAD' without being sugary and sentimental, for it would be impossible to say too many nice things about her. She is a wonderful person and an artiste whose records are welcome in anyone's home.